I swear that those 6 gallon cans that I've been using to haul diesel to the house for the tractor are getting heavier every year so I was looking for some ideas from you guys on how you transfer and store diesel for tractor use. I've been looking for a "farm tank" (on legs and gravity feeds) but haven't been able to find one. It's a mute point anyway because nobody around here will deliver small loads of diesel - less than 500 gallons and that's way too much for me to store and use. I've got a 55 gal plastic drum that I can use but but handling it would be a chore and I was wondering if there are any static electricity safety reasons for not using it when transporting it in the back of a pick-up with a liner installed or even for just storing it around the house. I was toying with the idea of installing a transfer tank in the pick-up and using that to haul and fill up the drum but I'm open to any suggestions you guys might have. How about running #2 home heating fuel as long as you use your tractor off road. If fact we call it offroad diesel around here. Most tanks are 275gallon and most all home heating delivery co. will deliver 100gallons at least where I live. I have mine in a poly 55 drum with a cheap rotary barrel pump from nothern tool. works well.I fill it up at the truck stop 5 miles up the road and unload it in my barn with a set of chain falls/ barrel grapple. I don't know how much diesel you go through but you do have some options. You can get those poly drums in 15 and 30 gallon also. I don't know how much you use your tractor but 15 gallons will go a long ways. If you could (man) handle the 15 gallon drum, then you could use one of those barrel pumps (like JAZAK5 suggested). You could always use the FEL to unload a full barrel of diesel, even the 55 gallon and use the same pump. Buy the off-road though. That will save you some. No one will sell you off road diesel here unless they have a copy of your agricultural exemption from the county on file. I could say it was for heating oil but no one would believe that in the middle of a Texas summer. I think I'll figure out some way to mount a couple of 55 gallon drums on the trailer and haul those to be filled with the $1.65 a gallon stuff. (That really hurts). I'll use the FEL to offload them when I get home and get a barrel pump, hose and nozzle from TSC as suggested. That's probably the easiest way to handle things. Thanks for the help and suggestions. What if it was to heat your hot water? The blue dye diesel is $1.73 here and #2 is $.99. That's $4.44 per 6 gallon tank. WOW! 4*If you could (man) handle the 15 gallon drum, then you could use one of those barrel pumps (like JAZAK5 suggested). 1*Thats what I thought too until I found out a couple of days ago that you can get around this in several different ways. I did the same dumb thing (paying on road prices for off road use) for 2 years till I finally saw the light. 2*Well just put 20 to 30 gallons in it then. 3*Are you getting off road diesel there? 4* Set the 15 gallon tank/drum on a dolly with 4 casters. Build a small stand the same height as your lowered tail gate and simply roll the tank out of the pick up right on to the stand. 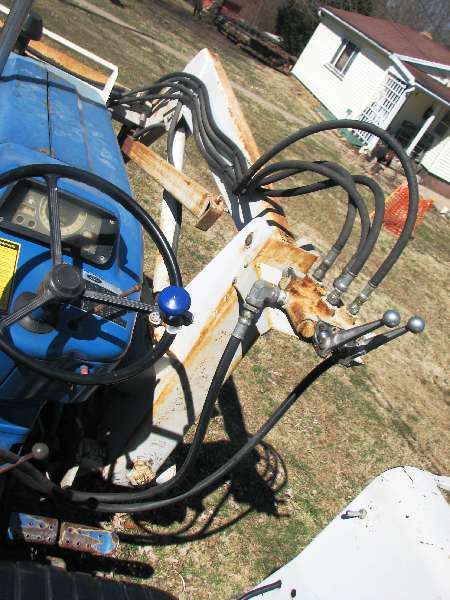 No need to lift and lug on the drum or get out the tractor to load and unload it this way.